Based on the story from Jules Verne Mysterious Island is set during the American Civil War, where three Union soldiers Cyrus Harding (Michael Craig), Herbert Brown (Michael Callan), Neb (Dan Jackson) and Union war correspondent Gideon Spillet (Gary Merrill) escape from a Confederate prison camp via a hot air balloon during a monstrous storm. They drag along a confederate soldier named Pencroft (Percy Herbert) and decide not to throw him overboard when it turns out he can pilot the balloon to their benefit. As they drift along they realize that they're above the Pacific ocean, a bit further West than they'd set out for, and during another whopper of a storm the balloon springs a leak they quickly descends, plummeting into the ocean just off the shore of an uncharted island. As they set about exploring the lush island they are attacked by an enormous crab, a fantastic Harruyhausen creation, but the castaways prove resourceful and end up pushing it into a boiling natural spring - which is awfully convenient, and ends up being whats for dinner! The men discover that are not alone on the island, upon the initial landing one of them men was knocked unconscious, his life saved by an unseen savior who pulled him up onto the beach and lit a fire for warmth, and after exploring the island a bit they run across two English women who were shipwrecked during the storm, the spunky Lady Mary Fairchild (Joan Greenwood) and her niece Elena (Beth Rogan). As they come together to form a clan and take up residence in a cave they must face a huge chicken, a swarm of giant bees, a group of cutthroat pirates and a monstrous octopus. During the encounter with the pirates the group's mysterious benefactor emerges, it's none other than Capt. Nemo (Herbert Lom, 99 Women), the sea-terrorist who with his iron submarine The Nautilus sank many ships before supposedly going down with his ships eight years earlier. Thankfully for them Nemo seems to have reformed his ways, and instead of destroying military sea vessels plans to curb world war by supplying the world with an endless supply of genetically modified animals and grains which he has been hard at work on for years while trapped on the island, but there's one problem, the active volcano on the island is ready to cover the lush island in a covering of molten lava, and they must devise a way off the island or perish. Here we have a wonderful fantasy adventure film, directed by Cy Enfleild (Zulu) who rises to the challenge that few others have in my opinion, crafting an engaging story around the eye-popping stop-motion visuals supplied by Harryhausen, and he does it very well, though it still feels like a canvas for the special effects to a degree, but is highlighted by a sassy turn from Joan Greenwood as the sassy English Lady Fairchild and a good turn from Lom as Nemo. 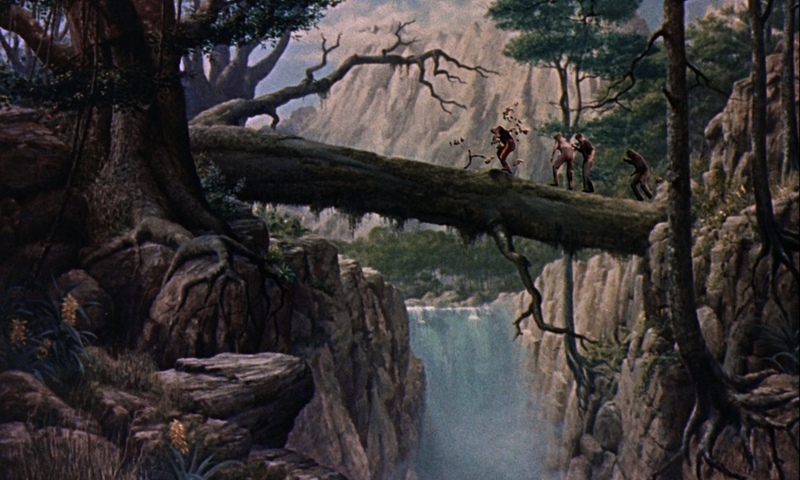 On top of that you have the wonderful Harryhausen stop-motion creations and some fun matte painting as the backdrop, though the live action does not mesh seamlessly as one would hope for I think they still stand tall in HD. Like most of these vintage science fiction/fantasy adventure films the science and logic are slap dash and improbable but epic fun just the same, turning a blind eye to some of the conch shell scuba gear is easy to do when the film is so front-loaded with wonderful visuals and imagination, and a wonderfully brassy score from Bernard Hermann. 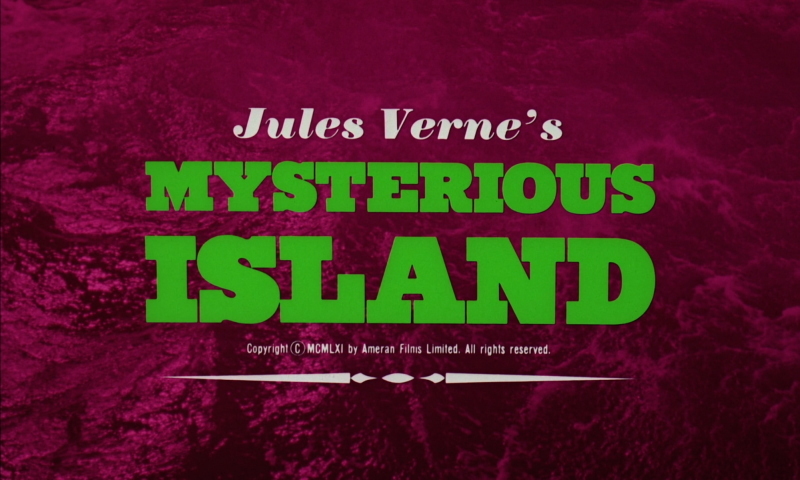 Audio/Video: Mysterious Island arrives on Blu-ray from Indicator with a brand new 2K restoration from the original camera negative, looking wonderful with a nice layer of grain intact, colors are rich and vibrant, skin tones look natural, everything is in order and looks great. Audio options include English LPCM 1.0 Mono and English DTS-HD MA Surround 5.1 with Optional English subtitles, the phenomenal brassy Bernard Hermann score sounding full and crisp, love it. 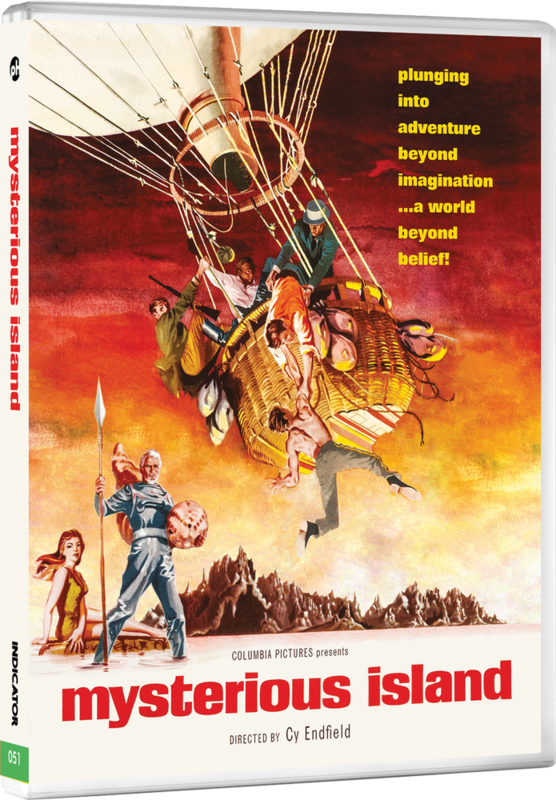 Onto the extras we get two audio commentaries, one with Ray Harryhausen and Film Historian Tony Dalton, and a second with film historians Randall William Cook, C. Courtney Joyner and Steven C. Smith. 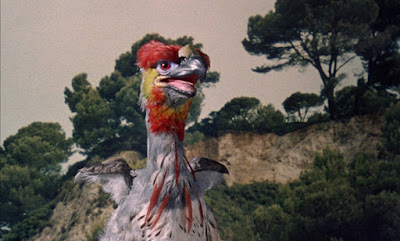 There are also interview with SFX maestro Hal Hickel, camera assistant Ray Andrew, Hal Hickel and a vintage interview with Harryhausen himself. One of my favorites is a 21-min interview with film critic Kim Newman, he goes into how the flick is a dual-sequel of sorts, it' a great watch. We also get a comic book adaptation of the film, a 19-min super 8 version, isolated music score, and a selection of trailers and TV spots, plus an image gallery. 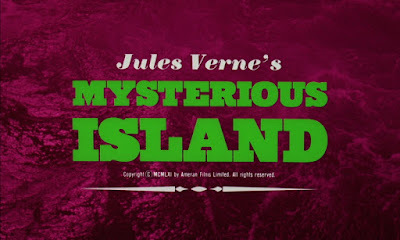 Mysterious Island (1961) is an epic adventure film with wonderful Harryhausen special effects, based on the beloved Jules Vern story, there also seems to be elements of H.G. Wells' Food of the Gods thrown in there, it holds up and this presentation from Indicator is phenomenal. 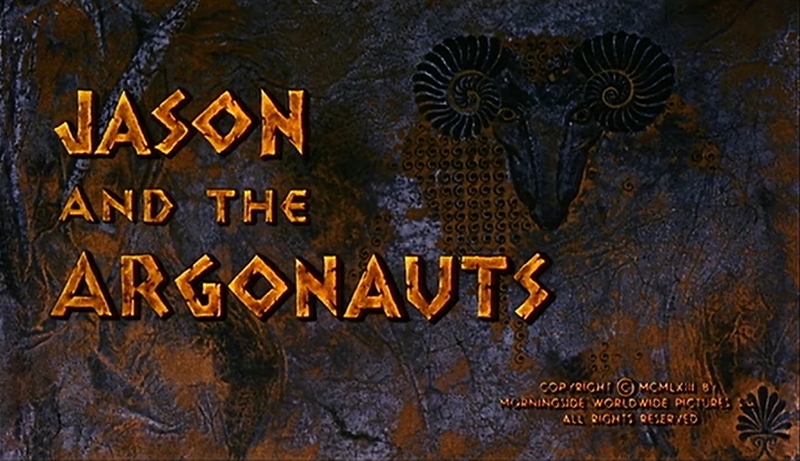 the tale of Jason and the Argonauts (1963), while I was never an enormous fan of Greek Mythology in school and in literature it was hard to resist the charms of this fantasy world come to life through the stop-motion magic of Harryhausen, who's movies invaded my dreams and imagination. 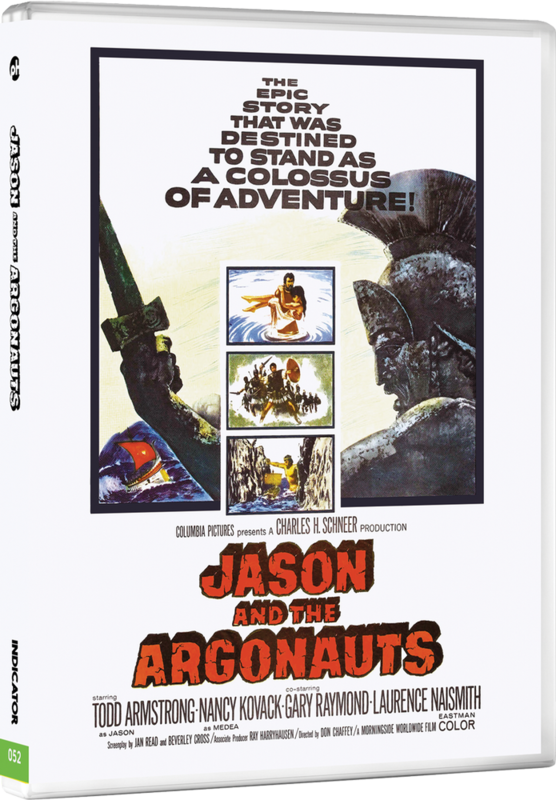 In short Jason and the Argonauts is the story of Jason (Todd Armstrong) whose sister, mother and father King Aristo are murdered by Pelias (Douglas Wilmer) who misinterprets the will of the god Zeus (Niall MacGinnis). Queen of the gods Hera (Honor Blackman) is angered by Pelias's actions, who desecrated her temple by murdering Aristo's wife there, in the aftermath she warns him to be wary of a one-sandaled man who will prove to be his undoing. 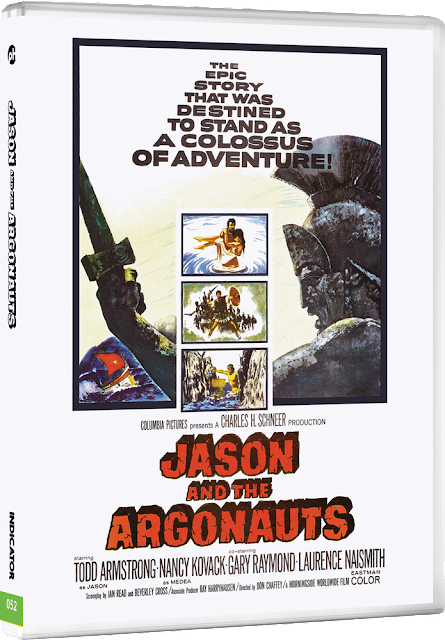 The infant Jason escapes with the intervention of the god Hermes (Michael Gwynn), and twenty years later an adult Jason rescues Pelias from drowning in the sea, during the rescue he loses a sandal, which alerts Pelias to his identity. Pelias keeps his own identity a secret as he encourages Jason to go to the ends of the world to steal the legendary golden fleece, hoping he will die in the process, but with the aid of the goddess Hera he assembles a team and builds a ship called "The Argo", together he and his team, including strong-man Hercules, a champion archer, master wrestler and others, head to the ends of the earth on an adventure filled with sword fighting, mythical monsters and prophecized outcomes, of course all this centered around the wonderful stop-motion imagery of Harryhausen. On their travels Jason is able to call upon the goddess Hera five times, as declared by Zues, and she is represented on the ship by a carved ornate masthead which from time to time speaks, opening her eyes and speaking to Jason. 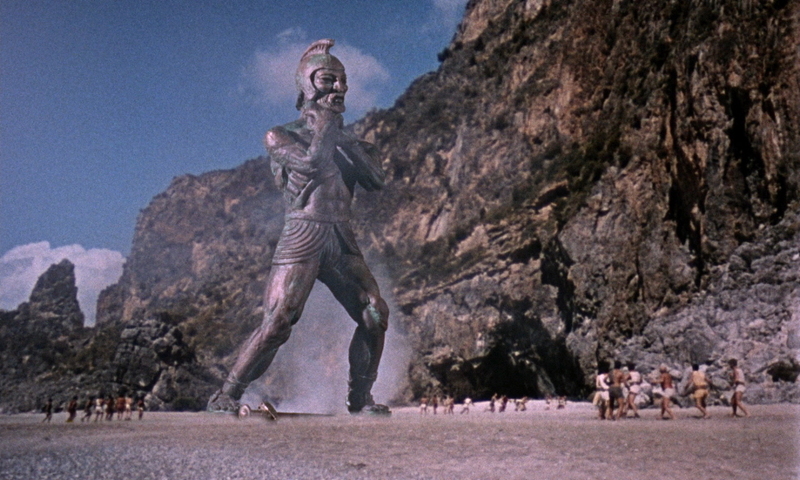 The winner here for me has always been the stop-motion creations of Harryhausen, my favorite being the attack of the giant bronze titan Talos on the Island of Bronze who is angered when Jason steals an item belonging to the gods, the way that Jason defeats him always made me feel sick as kid, slicing open his heel as his molten-blood leaks, for some reason it still affects me, which is quite a feat for a stop-motion death. Other obstacles to his journey include a pair of tormenting winged Harpies, a seven headed hydra, and of course the army of sword-wielding skeletons which grow from the teeth of the Hydra, once you see it you will never watch Sam Raimi's Army of Darkness the same way again. 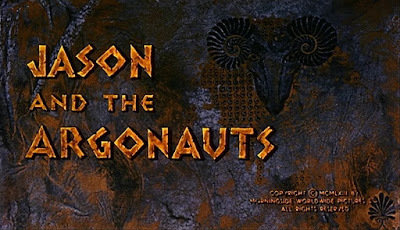 Audio/Video: Jason and the Argonauts arrives on Blu-ray from Indicator looking like it's a straight port of the Sony Blu-ray from a few years back, it has the same menu and extras, and no new Indicator exclusive extras, which is a shame, but the the A/V looks excellent throughout, there's a nice layer of grain, skin tones look accurate, colors are nicely vibrant, no complaints. Audio comes by way of a lossless DTS-HD MA surround 5.1 track, including an optional for a lossy Dolby Digital 2.0 track, the Bernard Hermann (Psycho)score sounds robust in the mix but not overpowering, dialogue is well-balanced, crisp and clean, optional English subtitles are provided. Onto the extras, as this is a straight port of he Sony disc we sadly do not get any new extras aside from the booklet that comes with this release but what they carryover is excellent! There are two audio commentaries, one with Ray Harryhausen and Film Historian Tony Dalton, and a second with director Peter Jackson (Dead Alive) and Visual Effects Artist Randall William Cook. Sony offer up a lot of Harryhausen love with a 26-min featurette,the hour-long The Harryhausen Chronicles narrated by Leonard Nimoy, and a 12-min interview with Harryhausen by director John Landis (An American Werewolf in London), all of which are Harryhausen-nirvana for fans, and a wonderful appreciation by all the people in Hollywood he influences through the years. Finishing up the disc we have a selection of trailers and a storyboard sequence of the skeleton fight. Unfortunately we do not get an isolated music score or image gallery for this one, but we still get loads of Harryhausen-centric extras. 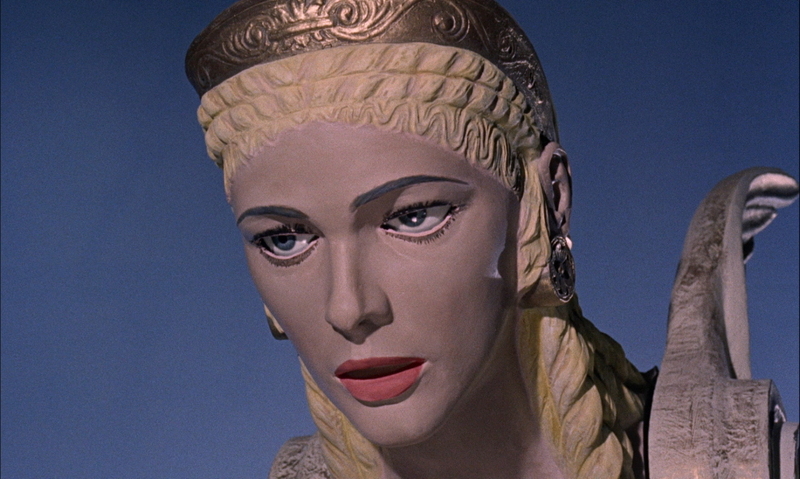 Jason and the Argonauts holds up well, lover's of vintage stop-motion adventure films are in for a treat, and you need not be and old codger to love 'em, my own teenager was fascinated with these, too. Not even my years of listening to me speak so fondly of this one could numb him to the vintage awesomeness of this Harryhausen epic. First Men In the Moon (1964) is the only film on this set that I'd never watched before, based on the story by H. G. Wells, it opens in '64 with the first U.N. sponsored manned-mission to the moon landing only to discover to their extreme surprise evidence somehow someone beat them to the moon sixty-five years earlier. A note left on the moon leads them to an old timer named back on earth Arnold Bedford (Edward Judd) now living at an old-age home, leading to him telling the fantastical tale of how he visited the moon back in the year 1899, as one of a trio of Victorian era astronauts, along with his fiancée Katherine Callender (Martha Hyer) and an eccentric inventor named Joseph Cavor (Lionel Jeffries, The Curse of the Mummy's Tomb). Back in 1899 Cavor created/discovered a gravity defying substance he called "cavorite", which when applied to an any object lets it defy the laws of gravity, as humorously scene when Arnold takes a seat in a chair painted with the substance. With little other choice them men follow the drag marks in the lunar sand and make their way back into the alien hive, along the way the men encountering more of the selinites, which are created both through stop-motion magic and throwing some kids in rubber suits, and they both work for me. 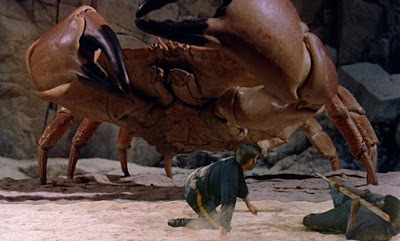 There's also a creature dubbed a "moon bull", looking very much like a menacing over-sized caterpillar with big red eyes and ferocious pincers, a fantastic creation, there's also some fun miniature and stage work done creating the subsurface lair of the creatures with crystalline structures, and a ray gun. The flick is just straight up fun, the scientific inaccuracies are hilarious, even for '64, but it all makes sense in a Victorian steampunk sort of way. The wrap around story is a nice touch, I particularly liked they way the Victorian era moon trip is resolved and how it played out in '64, all good stuff. Audio/Video: The First Men In the Moon (1964) arrives on Blu-ray from Indicator with a 4K restoration from the original camera negative, and it looks superb. The shots of the ship landing on the moon, the lunar surface and subsurface caves and tunnels are bursting with fine detail and vibrant coloring. Audi includes three options, we get English LPCM 1.0 Mono, English DTS-HD MA 3.0 English DTS-HD MA Surround 5.1 with Optional English subtitles, I preferred the 3.0 4 channel track third time around, the rumbling adventurous score from composer Laurie Johnson (Captain Kronos: Vampire Hunter) sounds terrific, we even get the option to listen tot he isolated music score. 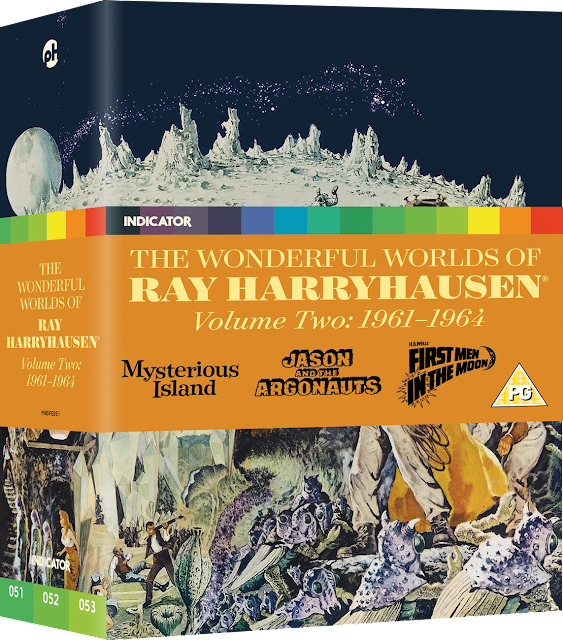 Onto the extras we get a massive amount, beginning with a vintage audio commentary with Ray Harryhausen and special effects man Randall William Cook, and an introduction from Cook. There are also new interview with Special Effects Assistant Terry Schubert, Title Designer Sam Suliman and production manager Ted Wallis, plus a vintage featurette, a trailer commentary from director John Landis, and a selection of trailers and TV spots, and an image gallery. We were only sent screener discs sans any packaging for the sake of this review, so I have no insights into that, but from what I've seen online and in the press materials the packaging and booklets for this set look prestigious and match the A/V and extras, this would look great sitting on your shelf. 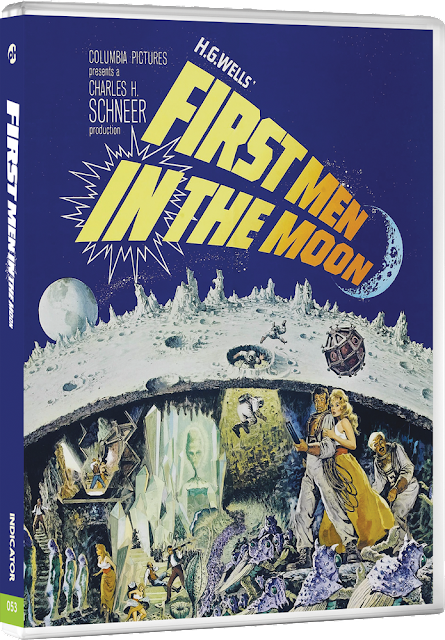 While I'm just a tiny but sad that First Men In the Moon eluded me for so long, I think this new 4K restoration made for a stunning first-time watch. As a kid this would have captured my imagination something fierce, but even now in my decrepit/semi-jaded 40's it pulled me in and won me over with it's Victorian steampunk charms. This is the second Harryhausen set from Indicator, and is truly full of wonder and awe, it's a nice revisit of some childhood favorites, and a great introduction to a Victorian astronaut tale I has previously missed till now. The A/V on these is top-notch, chock full of tasty extras and looks to have some gorgeous packaging. While I do not have the first volume I know what I'll be getting for Christmas for myself this year. Remember, while this is a UK release the discs are region-free and play just fine on a standard U.S. Blu-ray player!